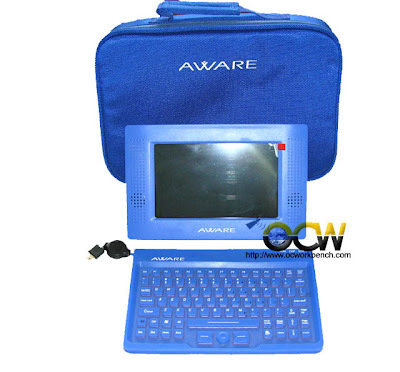 Aware Electronics (est. 2006) produces the A-BOOK series, which includes the A-View and AW-300 models. The earlier model AW-150 was sold in the USA as the MiTYBOOK. The A-view is described by Aware as an advanced digital photo frame with PC features. It is similar to and probably the basis for the Elonex ONE. It seems to be the basis of development for the newer AW-300 sub-notebook. GQView, Sylpheed email, Beaver (text editor), VNC, Tux Typing, and games.